Offering you a complete choice of products which include rapid moisture meter, verification of bernoullis theorem apparatus recirculating and pipe friction recirculating type. We are suppliers of Rapid Moisture Meter. The unit consists of a pressure vessel with clamp for sealing cap, rubber sealing gasket, pressure gauge is calibrated in percentage moisture content 0-25% ±1% (0-50% ± 1%) or on the wet weight basis a counter poised balance for weighing sample, a scoop for measuring carbide reagent, a bottle of reagent, one cleaning brush & a set of 4 steel balls for thorough mixing. Complete in highly polished wooden carrying case with handle. 1) 0-25% (Capacity 6gm, with mechanical balance) pressure gauge calibrated 0-25% x 1%. 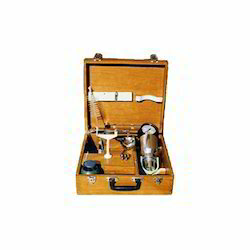 2) 0-50% (Capacity 6gm, with mechanical balance) pressure gauge calibrated 0-50% x 1%. 3) 0-50% (Capacity 20gm, with Digital balance) pressure gauge calibrated 0-50% x 1%. 750mm long with transparent solid acryalic. 1” G.I. piping and 1” Brass valves. Sump Tank – 900 x 400 x 400 mm M.S. tank with F.R.P. coating. Or S.S. tank. 9 manometric tubes fixed over the flow channel. Measuring tank.=400 x 300 x 300mm with pizometric arrangement. 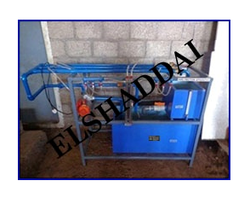 Floor space – 2 m x 2 m with suitable water supply. 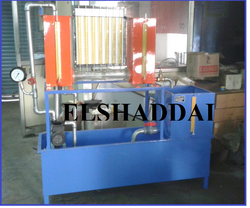 The unit consist of two pipes of different diameter. A collect tank is provided to measure the actual discharge. 1) Testing of two pipes of different diameters. 2) Measurement of head loss in the pipes at various flow rates. 3) Calculation of pipe friction at various flow rates. A) To determine coefficient of friction for pipes. B) To plot relation between pressure loss and flow rates for a particular pipe diameter. a) 29 mm, 22 mm.& 17mm. diameter G.I. Pipe. Length of pipe 1 m.
4) Measuring tank and stop watch. 6) sump tank – 900 x 400 x400 mm. Looking for Foundry Sand Testing Lab ?